This May will mark our 2 year anniversary and we want you to celebrate it with us! 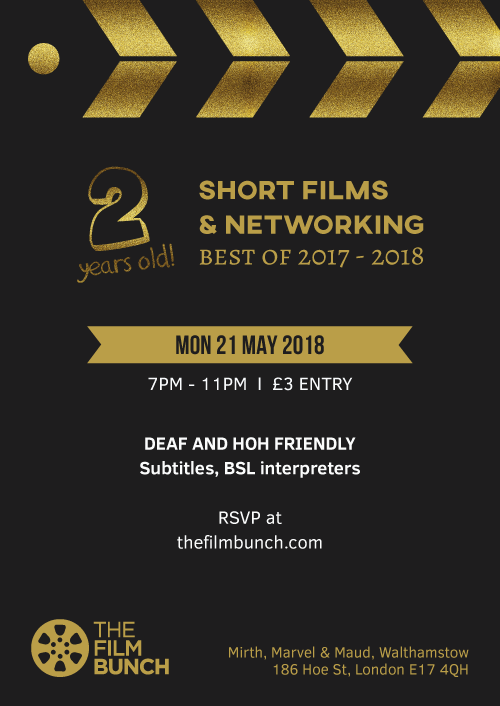 Join us as we screen some of the best short films from the past year and mingle with other film lovers. There'll be a few new films joining our screen too. Each guest will receive one free raffle ticket for a chance to win prizes at our event in June (you'll get an extra free one if you attend in June). We're also celebrating Deaf Awareness Week! We have a special guest appearance from Sophie Woolley who will give us an exclusive sneak preview of Unlimited award R&D commission Augmented, a powerful and funny one-person reading based on her experience of 'going hearing' after a cochlear implant. New Journey, the result of our recent one-minute filmmaking project, will have its premiere screening on this night! Tickets are only £3. We recommend booking online to save your space. Alternatively, you can pay on the door but entry will depend on space and priority will be given to those with tickets. No one turned away for lack of funds. Please email us if you would like to attend but funds are a barrier. A great opportunity to check out new talent and meet collaborators. Find out more about what we do at The Film Bunch and get involved. Open to everyone, feel free to invite your friends! Venue is 18+. How to get there: Nearest station is Walthamstow Central.